Something different for this year, instead of an evening meal, we decided to have a walk/lunch combination and decided on Birsay Bay Tearooms for lunch, with a choice of walks before. 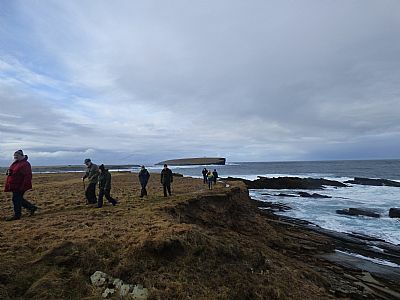 The original plan was to have one group walk from Marwick to Birsay, and another do a circular walk around Northside, however a day of heavy rain yesterday put paid to our plans. Instead 10 of us met at the Brough of Birsay car park and enjoyed a shorter circular walk around Northside, we even had blue sky and sunshine! 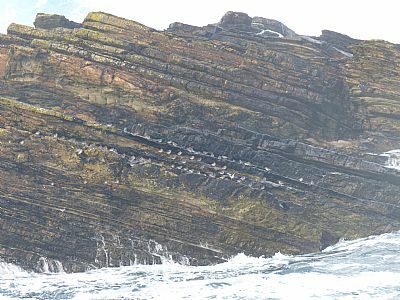 We had great views of Purple Sandpipers - there were 2 big flocks, one with approx 35 birds and the 2nd flock just past the whale bone had approx 50 birds! In addition, we had good views of both male and female Goldeneyes, curlews, oystercatchers, seals, and some lovely starling murmurations. 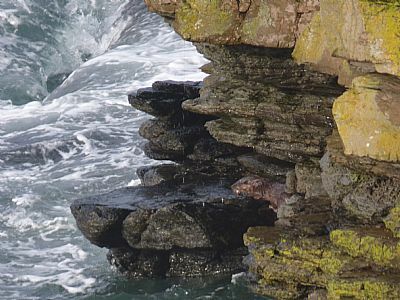 Our final surprise, was Graeme spotting an otter! It was swimming & fishing in the bay below us, and we all got amazing views of it - they are such a pleasure to watch! After a lovely walk, we enjoyed a fantastic lunch at Birsay Bay Tearooms.